I think that the ability to tell stories is fundamental to fashion. 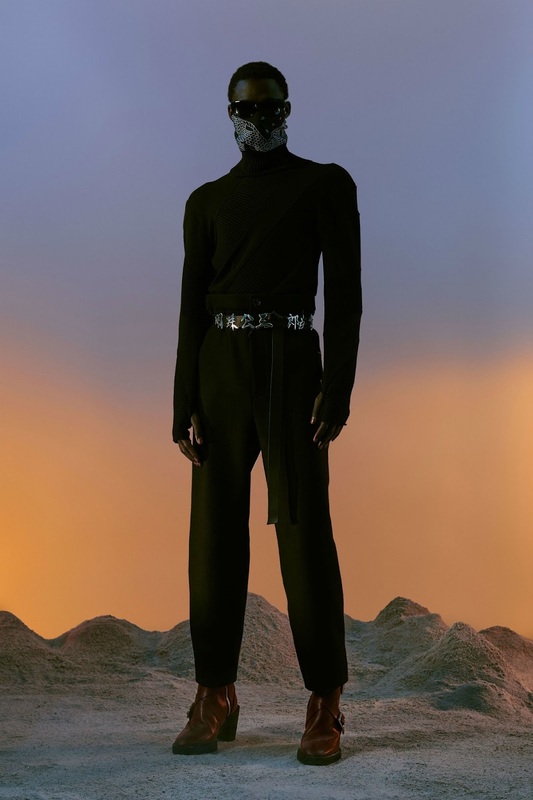 The designer seeks to tell a story (or stories) through their clothes, their show, their interviews, their advertising campaigns, their websites, their social media feeds, and their retail spaces. Fashion magazines and stores will then pick up and style the clothes and seek to narrate new stories for their audience. This is followed by the individual, who buys the clothes and wears them - this is done in a variety of different outfits, as opposed to a single look. In doing so the individual seeks to narrate a myriad of stories that reflect the multiplicity of their expressed identity. I do not think of identity as some fixed notion, but as a fluid concept that we are constantly producing through narratives. Nowhere is this more evident than through the clothing we choose to wear because we are essentially showing ourselves in a constant state of becoming. Our notion of self and our understanding of our place in the world (in terms of both space and time) is reliant on the stories that we tell ourselves, we tell others, and that others tell us. Indeed the process of expressing an idea of who we are, is usually coupled with expressing both when and where we are. We believe that our clothing says something about us as an individual and tells our story. There is however a disparity between what we think we say and what others believe us to say, so in that sense it is always open to interpretation. But at the same time our clothing can be used to place us historically, socially, spatially and geographically. Indeed fashion relies on this process in its referencing of the past. 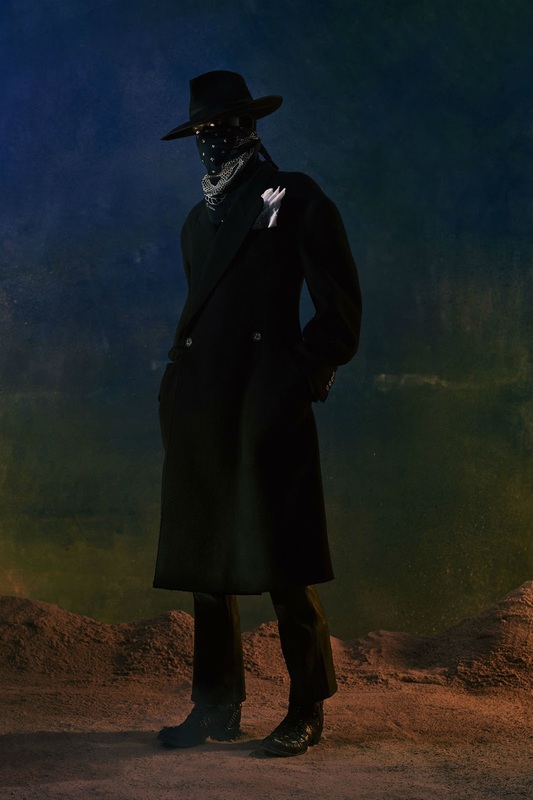 Stylistic and aesthetic elements are used as a visual shorthand for both time and space - we come to recognise a '70s Californian reference, or a Victorian London reference, or simply a trend from last year that was pervasive on social media. Stories are then interpretive devices that allow us to understand our lives and the world. But this is exactly where anxieties over authenticity arise, because we are unsettled by the gap between perceived semblance and perceived substance - am I what I say I am? Indeed traditionally in the West the idea of being has been counterpoised to the idea of doing. What I mean by this is that the being of our self has been seen as more authentic than the doing or performing of our self. Of course Goffman sought to change this with his belief that there was nothing behind the mask, because the self was the mask. People often talk about feeling like a fraud, or the idea of faking it until you make it, and that anxiety is based on this ostensible dialectic. These stories are not simply narratives we tell ourselves and others through language. I think that in a wider sense it is about expression. A story can be told through language, through music, through dance, through painting, through food, through a ring passed down from generation to generation. A house can tell a story, a car can tell a story, a watch can tell a story. The material world is filled with objects that have stories to tell, with many of those stories older than humanity itself, which will continue long after humanity ceases to exist. I like looking at the world and imagining how old things are and the lives and stories that they have seen, from a tree to a brick. Pick up the thing closest to you right now and think about the materials it was made from, where they came from, how it was made, where it was made, and the journey it has gone through to get to this exact moment and this exact place. 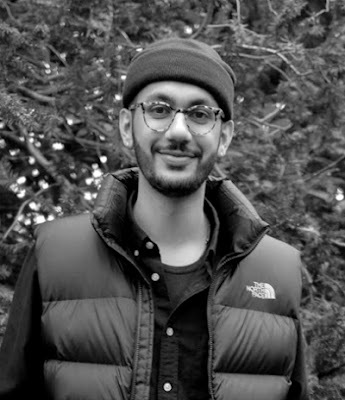 Ultimately each and every thing and person has their own unique set of experiences and narratives. But these are not fixed narratives, but a matter of perception through time. Indeed our sense of self is constantly evolving through the differing narratives we tell ourselves and others. To use a very basic example, say I cannot ride a bicycle - I tell myself that I am someone who cannot ride a bicycle. Then I begin to learn how to ride a bicycle - I am no longer simply someone who cannot ride a bicycle, but someone who cannot ride a bicycle yet, because I am in the process of learning. Then I learn how to ride a bicycle - now I am someone who can ride a bicycle, who is not the same person as the one who could not ride a bicycle. Multiply that by an infinite amount of variables and life experiences, not to mention emotional attachments to each narrative, and you can see how complex the story becomes. At the same time I like to think about how we each have our own unique viewpoints and how these come to encompass our own truths. I experienced yesterday, just as you experienced yesterday, just as seven billion other people experienced yesterday. But we all have our own unique version of yesterday that is true for us, and probably only for us. We can all produce a narrative of yesterday, but each will be individual, because nobody experienced exactly what I experienced yesterday. So if I had a terrible day yesterday and you had a fantastic day yesterday, then neither of us can say that yesterday was all good or all bad, we can only speak of our experience of it. And obviously this narrative is subject to change over time. If we are asked to recall yesterday a week from now, we might feel differently, and if we were asked to recall yesterday a decade from now, the chances are that we would remember nothing about it at all. But if we rehearse our narrative of yesterday, and others rehearse their narratives of yesterday, and we remember independently or collectively, then years from now yesterday takes on a monumental importance. The fashion cycle is a process of constantly rehearsing and rewriting narratives from the past in order to tell new stories. And so I really do enjoy the work of designers who are able to tell stories that feel fully formed and alive, rather than a fleeting moment that lasts for the duration of the show but you forget the moment it is over. 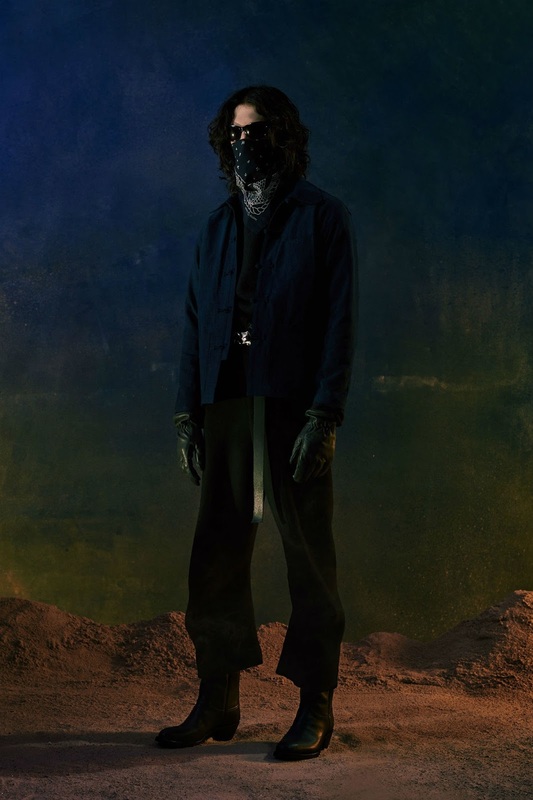 That is what caught my eye with the Kozaburo Autumn/Winter 2018 collection above, because I feel like the designer Kozaburo Akasaka created a world through a look book that I found really exciting. 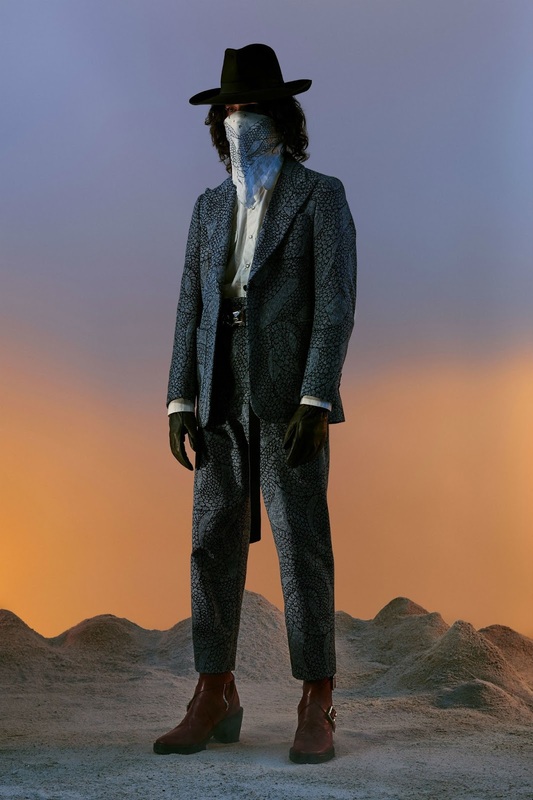 Akasaka won the Special LVMH Prize last year, but I have to admit that I did not really know anything about his work until I saw this collection. 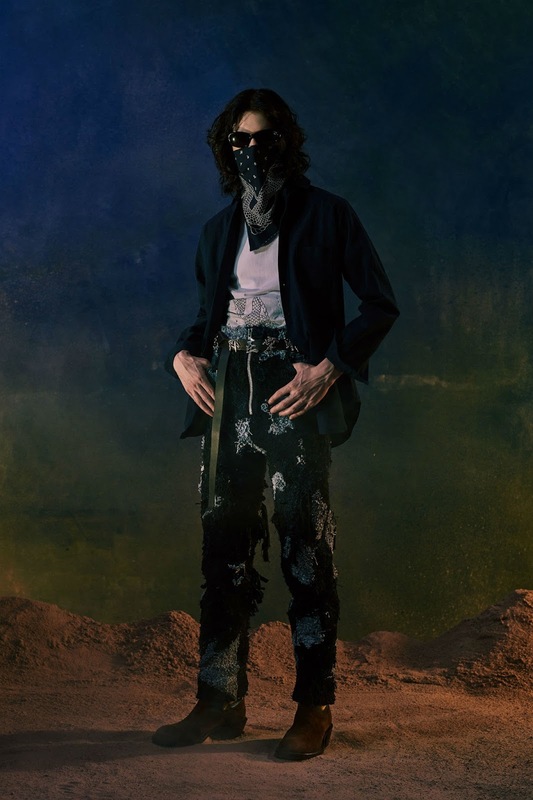 Born and raised in Tokyo, the designer originally studied philosophy at university, before he left to enrol at London's Central Saint Martins, followed by the MFA degree at Parsons in New York. 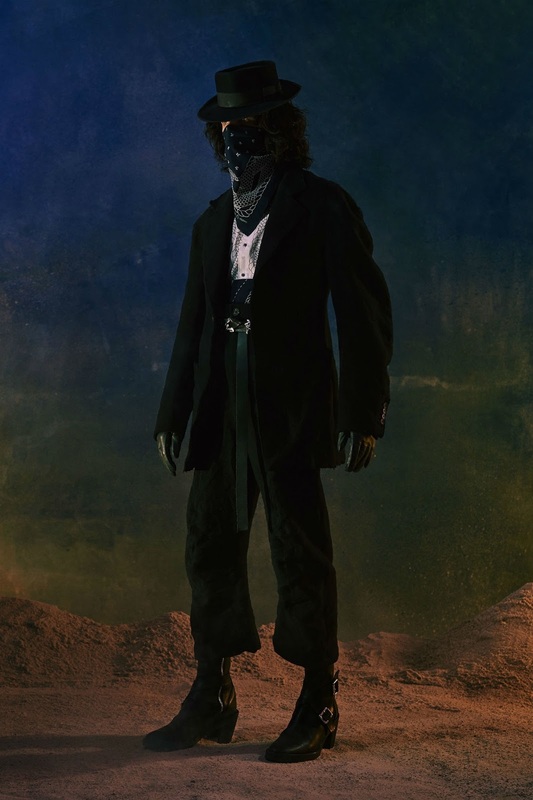 The collection above is only his sixth, and yet to look at the way he has developed and refined his style over the past few seasons is a testament to his strength in design and ability to tell stories. I found it unsurprising to discover that Akasaka holds Thom Browne in high esteem, because Browne's shows are for me a master class in storytelling. 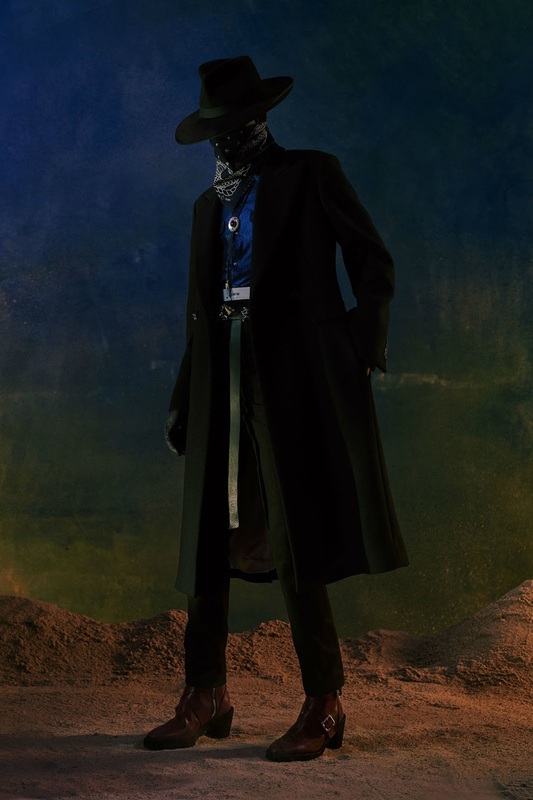 With this collection Akasaka took cowboy boots as his starting point and sought to portray the American West through the lens of his Japanese upbringing. 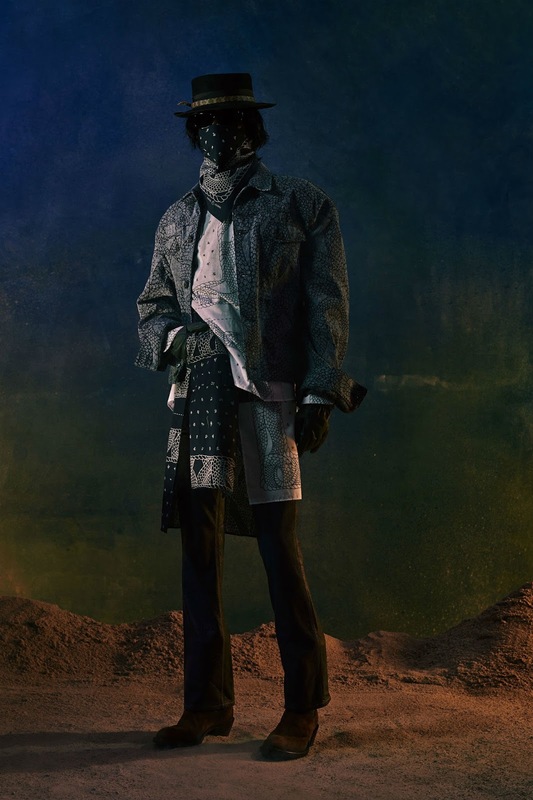 Hence details like denim jackets made using sasiko, belt buckles featuring oni heads, and belts featuring Japanese characters spelling out "rain falls on everything". 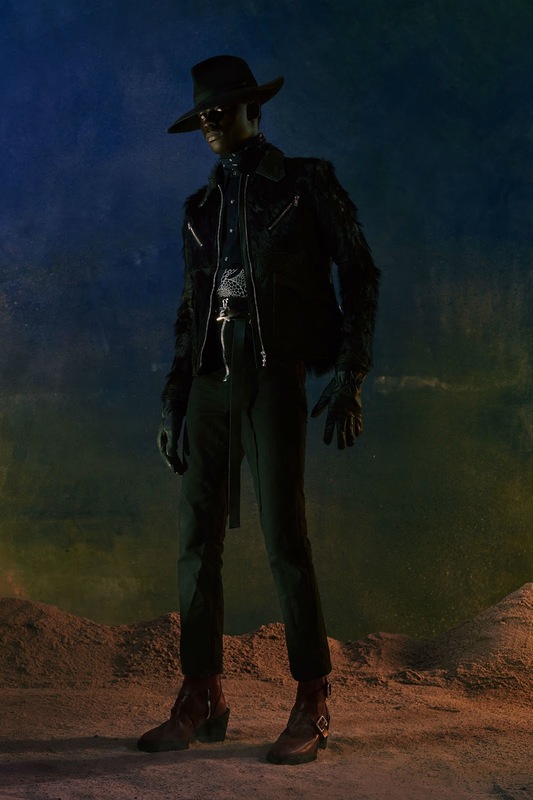 I love the dark indigos and blacks, and the restrained use of patterns in preference for more textures, such as the recycled yarn jeans or furry jacket. I thought that the snake patterning on the suit, that also featured on a coat, was really cool, because it is one of those details you would miss at a quick glance, but up close is no doubt quite a visual treat. The shapes and silhouettes, such as the curved jacket sleeve and curved and flared trousers, are a continuation and refinement on patterns that featured in past collections. I would love to try them on to see how they feel and move. 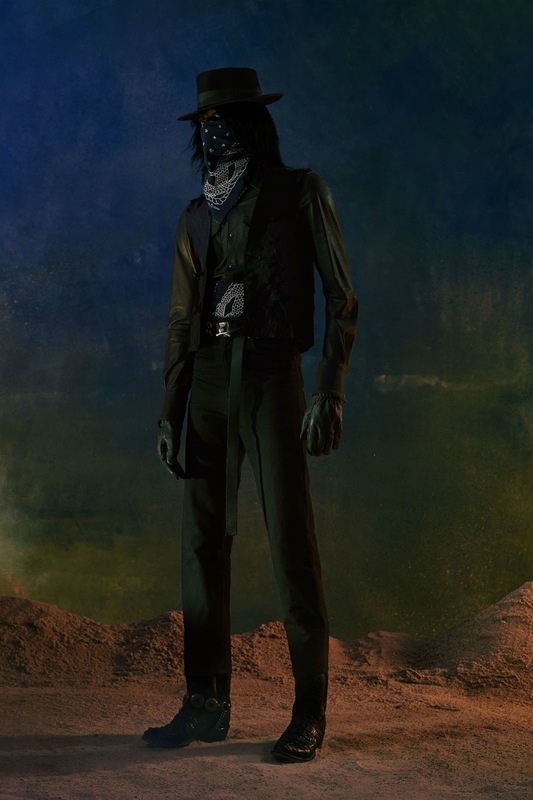 I think that the lookbook was really well done, and made me think of criminal cowboys on an alien planet years into the future. In fact after looking through the collection two or three times my mind was already conjuring stories for each character and the world they would inhabit.